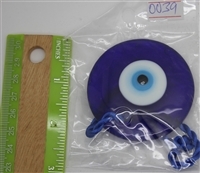 Hanging Evil Eye ornaments models includes for walls, doors, or cars. Some models includes suction for glass. Made in Turkey, select size. Evil Eye Small Dolphin Charm/Pendant - Approximately 5" Long. Each item are individually wrapped. 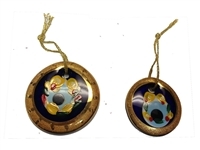 Evil Eye Gold Edge Color Painted 2.25"
Evil Eye Owl Amulet - Hanging. Individually wrapped. The design is as shown in the image. Evil Eye Gold Edge Color Painted 2.75"